I wanted to know how energy drinks compared to soft drinks and coffee in terms of caffeine amounts. After all, energy drinks are sweet, carbonated and refreshing, so it’s as easy to drink them as you would a Coke or other soda. And coffee is still the top banana when it comes to caffeinated beverages, but a Starbucks coffee tends to be more potent than a home brew. Even though a single “mainstream” energy drink delivers a solid caffeine rush, most fall within levels that health professionals consider safe. However, kicked-up versions of the same brand can more than double the caffeine. And drinking more than one can of any energy drink can push caffeine into risky levels – especially when teens slurp them up like soda. A “mainstream” energy drink contains 160 mg of caffeine per 16 ounces – according to the American Beverage Association (ABA, the industry’s lobbying group) – or half as much as a “coffee house” coffee (i.e., Starbucks) of the same size. But the ABA doesn’t mention that a regular coffee (the kind you’d drink at the office or brew at home) has about 100 mg of caffeine. 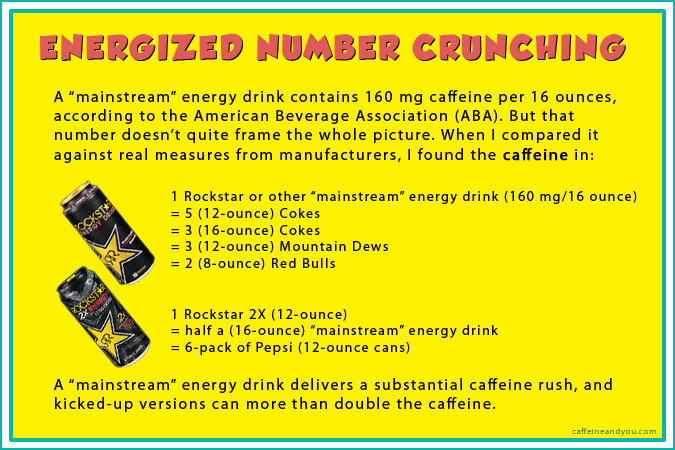 So, you could drink 1 “mainstream” energy drink like Rockstar, or 3 Cokes. Or for more punch, you could drink one Rockstar 2X and get the same caffeine as a six-pack of Pepsi, but faster. I’m not against energy drinks and slurp them myself from time to time. But it’s important for people to have a clear understanding of what they’re consuming, and comparisons like these help frame the whole story.